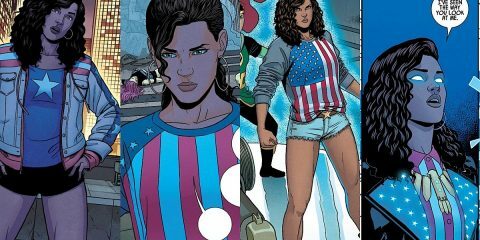 Representation Matters: What's Next for Latinx Superhero Stories? Thanos is back and something isn’t quite right. This new #1 marks a good jumping on point for what looks like an interesting story. We see Thanos regain his throne. As this happens, his own son, Thane, is plotting against him. As we see Thanos returning, we see who all his son starts to gather in retaliation. It’s intriguing from the start and looks like a good story to follow. Jeff Lemire is at the helm for this run. Since 2015, he’s been on a nice run for Marvel with titles like Old Man Logan and Extraordinary X-Men. While he writes multiple titles at once, it doesn’t show in this issue. He clearly thinks out the arcs well and this is a great introduction. While it is best to know a little about Thanos before jumping into this one, it’s not necessary. He also chooses some solid secondary characters, especially with his use of Thane. The art on this issue feels perfect for it. Mike Deodato teams up with Frank Martin on art and they compliment each other well. 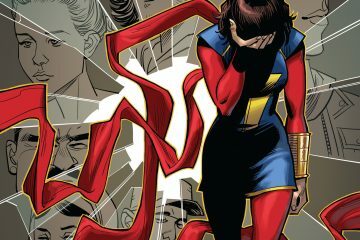 The style feels unique and not what we typically get in Marvel comics. There are some fantastic close ups of the characters to really emphasize certain aspects of them. It really is a great looking book. 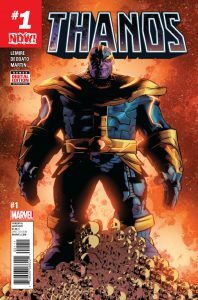 As someone who hasn’t read many solo Thanos stories, this has my attention. Thanos is dying and we don’t get any clues as to why. All we know is that Thane’s master plan is in motion. DC is my go to with their Rebirth issues, but Marvel earns more of my attention lately with titles like this. Verdict: Buy. Thanos is one of the most powerful villains imaginable. He’s given a solo title and Jeff Lemire hooks you in one issue. I’ve read little of Lemire, but this issue makes me regret that a bit. There’s no harm in grabbing #1 issues to check out, so make sure this is one of them.